Former Harmony Magnet Academy student Diana Ramos has been named winner of the 2018 NAF Next Alumni Award. The award recognizes NAF alumni who have achieved success in either college or their career, or have demonstrated an entrepreneurial spirit that can be attributed in part to their academy experience as Ramos is one of three honorees for the award. After graduating from Harmony in 2012 through the AOE (Academy of Engineering) Pathway and No. 1 in her graduating class of 104 seniors, Ramos attended the University of Southern California as a QuestBridge Scholar. Ramos earned the full-ride scholarship through the QuestBridge Scholar program as one of only eight students admitted out of 321 finalists. 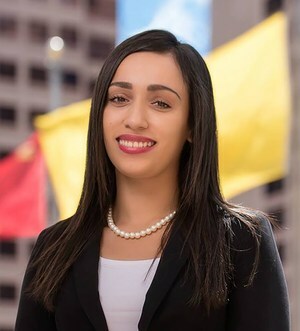 Ramos earned her bachelor’s degree from USC in biomedical engineering in 2016 and will earn her master’s degree in engineering management this December. She is currently an engineering intern for Honeybee Robotics in Pasadena, Calif.
Ramos will be accepting the award at the NAF Next event in July in Washington, DC.